Relive the moment, over and over, by purchasing one of our professional picture or video packages! With one of our picture packages, you can expect over 100 high quality digital photographs of your skydive, and with one of our video packages, you can expect a personalized 4-7 minute film, customized and set to music, packed with the most pivotal moments of your skydive. Both packages are formatted into an MP4 files for video and jpeg files for photographs, allowing you to share and post them wherever you choose. Strict United States Parachute Association regulations unfortunately do not allow the use of personal camera or video equipment during your skydive without special licenses. For this reason, we highly recommend you take advantage of one of our personalized packages to relive your breathtaking experience for years to come. Save $10! Pre-purchase your video package, today! The Personal Perspective package offers a unique perspective on your skydive. A camera will be attached to your instructor’s wrist and will provide a self perspective view of the exit, freefall, canopy ride, and the landing of your skydive. 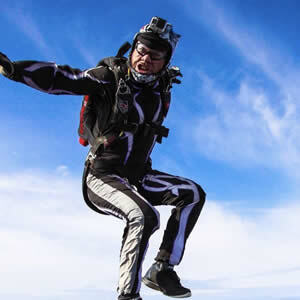 The personal perspective package will capture your raw emotions during all aspects of the jump, making it an awesome choice for those looking to relive the moment over and over. While this option less expensive, make no mistake, the quality is still top notch. The professional still photographs package is perfect for memorabilia. We have the highest quality images that you can turn into a poster for your wall or a pillow for your mom! It gives just a little bit of a glimpse into the thrill that you got to experience. With our enthusiastic instructors, you're bound to have the biggest smile on your face! The brilliant colors and vibrant clarity of your photos will be perfect for posting and sharing with friends! The combo package is the most ideal if you want skydiving pictures and video. It combines both the personal perspective package and the still photographs package in one. Each offer a unique view of your skydive that gives us the ability to capture each exhilarating moment from beginning to end. While this option is most expensive, an experience like the one you will have deserves a package that can capture it all! We also have other video packages to offer based upon availability. After you land and you celebrate your accomplishment, our team gets to work editing the footage from your skydive, turning raw footage into what can only be described as an awesomeness with various music, titles, transitions, and special effects, to really make your video pop. We have a vast amount of music to be featured in each video, though unfortunately due to copyright infringements, you may not choose the music for your video. The total time of editing your video and converting it into MP4 format may take up to a week, but will be emailed to you when finished, and can be shared and uploaded to wherever you like! It is not uncommon for someone new to skydiving to assume the video they purchased will be for an entire group of people. However, it simply isn’t plausible. Every jumper exits the plane sequentially, with an amount of time in between each jumper. While all skydivers wish the laws of physics did not apply to them, the videographer cannot fly back up to capture the next jumper’s video. The interview done before the jump, and after the jump can be filmed with friends and family, though the jump itself can only have one star, you! Remember! Your first skydive is the only first skydive you will ever have! Skydiving for the first time is a once-in-a-lifetime experience! 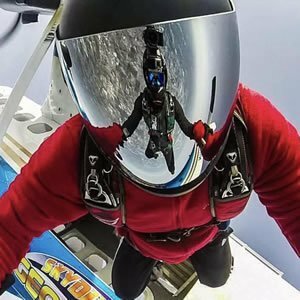 No matter how many times you jump, if any skydiver has ever had a regret, it is that they did not purchase a picture or video package for their first skydive. Don’t make your first skydive just a once-in-a-lifetime moment, purchase a picture or video package and relive it whenever you choose! Document the most memorable and crazy experience of your life. Call Skydive Philadelphia at 215-258-2255.